Do you yearly shovel your finally finished compost into a pile with enthusiasm, only to step back to behold a molehill instead of the mountain needed for your garden? Do you find yourself considering outrageous schemes on how to collect those cow pies from the neighbor’s pastures, since you have no animals of your own? Do you have visions you’d rather not have when you hear the term "Green Manure"? Not to worry, help is on the way. And for once it doesn’t cost much in time or money. Green manure is simply any crop grown to be turned into, or cut down to lay on top of, the ground for the purpose of adding organic matter and nutrients to the soil. No matter if your garden is ‘tiny small’ or ‘acres large’, you can make use of green manure. Any part of your garden not growing a crop can be growing some green manure. Basically, you plant the seed, let the crop grow, then dig or till it in or cut it down to lay on the ground to rot. When you feed your soil, you feed your garden, and green manure is a great food. All the plants growing in your garden can be considered green manure. Just let them rot where they are. But sometimes you want to add a little more. Plant matter has been the only input in my garden for most of its years, except for a very small amount of compost here and there, and it produces more than enough healthy food for our use with enough left over to keep the insects satisfied. Who could ask for more? Green manure can be grown and used in a number of different ways in your garden. If you are starting a new garden, or expanding the one you already have, green manure can make the job easier and add much appreciated organic matter to the soil. 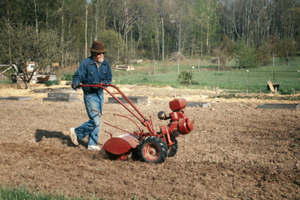 Even if you plan on having permanent beds and working your plot by hand later, a tiller can be a great help in the beginning. But this can also be done by hand with a shovel, which would be more appropriate for a small plot or a tight area. Start working your new plot whenever you and the soil agree (i.e., you have the time and the soil is not too wet, too dry, or too frozen). Till in the native vegetation (which is also green manure), plant your seed, let it grow to a comfortable height, till or dig it in, plant more green manure, let it grow . . . and so on. The more time you can spend preparing your new ground in this way, the easier your gardening will be in the first years. The green manure will not only add a great deal of plant matter to rot and feed the soil, it will also help to crowd out the native weeds and vegetation. All that tilling does mess up the natural soil structure and it will take awhile for the soil communities to reestablish themselves and their lives, but I think it is worth it to get that change from whatever the land was naturally growing before, to the garden crops you'd like to grow there. It is nice to give sections of your garden a rest and refreshment once in a while. I often have a few beds out of production every year, growing just green manure. How often depends on my schedule and how fertile the individual bed is. I don’t get too fanatical about this, but I keep an eye on the soil and plants as I work in the garden. I also look back at what was grown in a particular bed in previous years when laying out my pre-season garden plan. If a bed has been in production for a long time without a rest, I’ll plan on growing green manure there the coming year. Most plots get a recuperative rest about one in five years. And when an unexpected devastating freeze hits the end of June or mid July (or hurricane or tornado or flood or whatever), thereby wiping out a great number of your carefully planned and tended garden crops, then a large part of the garden can luxuriate in green manure that rest of that season. Once you resolve that this is a great break for the garden, and to be honest, a not unwelcome break for the gardener as well, it makes these disasters a lot easier to deal with. Assuming you’ve put by enough food in better years to get you through. If not, you can make good use of farmer’s markets and food coops for your normal "garden grown" food, and dream of the wonderful harvest you’ll have next year. But in 'normal' years, whenever a crop is harvested, you can consider planting green manure in that spot. In our neck of the woods the growing season is rather short so I don’t often have the luxury of double cropping. But in some areas this can be a regular part of the routine. Harvest the peas or beans or beets or such, leave or cut down or dig in what’s left, then plant green manure seed among the rubble. It doesn’t matter if it’s a few rows or a few acres, it’s all the same to the soil. Before planting green manure in a plot, I consider the quality of the mulch that is there. If it is still thick, I might just let the area alone and leave the mulch to continue keeping the weeds down and adding nutrients as it rots. But often the mulch is well on its way to decomposition, so I toss seed over the area, lightly mudge it in with a rake, and let it grow. Even partly rotted hay is hard to dig in, and digging anything in is a lot of work, so I do a lot of sheet composting with plant material and green manure -- when it gets tall just cut it down and let it lay on top of the ground to rot. This is my preferred method. If I haven't been doing a good job of weeding, my strawberry beds tend to get inundated with dandelions, grasses, and other perennials that are hard to remove from the thick mat of strawberry roots. So I choose another plot and transplant runners to start a new bed. After harvest is over in the old bed, I roughly turn the plants over with a shovel, then plant green manure into the lumpy ground. I let it grow, then cut it down in the late summer to settle and rot until next spring. This works well, but I have also simply cut the strawberry plants down short, then thickly mulched the plot, planting something sturdy into that area in the next spring (such as potatoes or corn) since the strawberry plants roots are usually not completely rotted yet. Weeds are just another green manure crop. The trouble with weeds is that they are often tenacious perennials that don’t cooperate much in the "rot and don’t regrow" idea of green manuring. However, I have been known to handle an occasional overly weedy plot (we won’t say how occasionally) with the dig and bury method. It’s not the best. It’s not going to get rid of all the weeds and it is not going to get your garden in a glossy magazine. But it will buy you some time. You would, of course, be better off to get down and get dirty with hand to hand digging with a trowel. But, when you just don’t want to, here’s an alternative. Take a shovel or fork and roughly turn the weeds under. Then plant a thick crop of green manure into the dirt. It is going to be rough and lumpy, with some seed falling down in the deep crevices between clots, and others barely holding on at the top of a root ball, but ignore the mess and roughly work the seed in with a rake. Let this grow, then either dig it under, which will be a challenge because of the root balls, or cut it down to sheet compost on top. Leave it to rot and settle over winter, then deal with it in the spring. 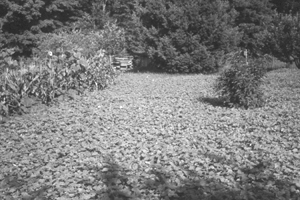 If it is early enough in the season, plant a second green manure crop into the mess. It will be beautiful again soon enough. This method also works well, though not without a lot of muscle power, in turning an old area of lawn or field into a new garden by hand. In this case, mow the area short before turning the sod under. The more green manure cycles you can do the better. There may come a time when you decide to bring your garden down to a more manageable size. Or you want to move it to a new area. Instead of just leaving the old plots to grow over lumpy and bumpy, smooth the outgoing section with rake or tiller and plant a light nurse crop such as a grass or grain with clover to keep things under control until the natural vegetation can take over. This isn’t exactly a green manure crop, but it’s similar and can help that old garden into its new life. WHAT TO PLANT FOR GREEN MANURE? Green manure seed can be just about any seed that you have or is available in your area, though some will be more appropriate than others. I have a variety of favorites. You can mail-order green manure seed, but because of the quantity and bulk of the seed used, that route is rather expensive and seldom necessary. Instead, check with local farmers or the local feed-mill. Tell them what it is for, and they should be able to give you an idea of what is commonly grown and available in the area. Buy bulk feed seed, not certified seed. You don’t need purebred -- regular everyday will do. You can also grow your own. BUCKWHEAT is one of the main workhorses of my green manure crops. It produces even in poor soil, it is easy to grow and cut down or turn in, and it’s beautiful. Though not grown by farmers in our area as much now as in the past, I can almost always get a bag of it at one feed store or another. A ten pound bag will last quite a while. Its one drawback is that it is a tender crop and will be killed by frost. So I use it as a summer green manure crop. Buckwheat is also a favorite for beauty, and the bees love the flowers. Now, I do need to tell you that for green manure you should dig it in or cut it down long before it flowers. When it’s about a foot tall. As with all green manure crops, it is hard to dig in when full grown. And if you are digging it in by hand, you definitely want to catch it before it gets too tall. However, in my garden it usually gets to the flowering stage before I get to it. And once there, the plants are so full of enthusiastic bees, I can’t even consider chopping it down. So we happily compromise. They get the nectar, I get the enjoyment, and I mow it down with the scythe when the blossoms start fading but before the seed sets. If you wait until the seed is formed, you’ll plant another crop of buckwheat in that spot. The nice thing about buckwheat in the cold season areas is that it easily winterkills, so you don’t have to worry about having to weed a lot of it out of that spot the following season. OATS are another favorite of mine. Wheat, barley, rye are similar to grow. But oats are readily and cheaply available here from farmer or feed mill. And oats winterkill better than the other grains, so I don’t have to worry about them regrowing next spring. Any of the grains can be planted early in the spring, and fairly late in the fall and still make some growth. They don’t give as much plant mass as other crops, but they are easy and reliable. I sometimes plant oats early, cut or dig in the crop a month later, then plant a mixture of oats and buckwheat in the trash, cut that down in about a month, and plant oats again. PEAS are another good green manure crop. They not only are easy to grow, but add good things to the soil. The farmer’s field peas are rank growing and easily procured in many areas. You can also use your own extra garden pea seed. I often plant a mixture of peas and oats (or other grains) in the spring. They complement each other. The grains crowd out weeds better and the slower growing peas add more leafy material. They are tangly, however, when full grown and hard to cut down with a scythe or to dig in, so it’s best to take care of them when they are about a foot tall. SUNFLOWERS are not usually considered a green manure crop. But if you feed the birds, you may find yourself with extra old seed. Plant it thick and it will work fine for green manure. If you cut it down instead of digging it in, the plants will usually continue to grow and flower, growing shorter each time until you have foot tall flowering sunflowers in your plot. I’ve found this happens with many flowering plants. CLOVER and ALFALFA are often touted as the great green manure crops because of their nitrogen adding capability. But this is one plant I would not recommend for most gardens -- because it is very tenacious and grows wonderfully long and thick root systems. Which is what makes it a great field and pasture crop. But when in the garden, it can be a terribly difficult weed. It is also usually slow growing, so not practical for ongoing green manuring. It would work fine for a new area that you have several years to work up before turning into a garden. But as clover seed is also quite expensive, you may want to use vetch, beans or peas instead. VETCH: If you buy rye seed in this area, you often can also get it mixed with vetch. Or it may contain vetch seed whether you want it or not. Vetch is an annual or biennial legume and can produce a lot of plant matter. But since it is also a strong grower and can overwinter, I don’t use it in the garden. It can be a good choice for new garden preparation, however, if you are using a tiller to dig the plant material in. It's also beautiful when in flower and I love having some in the fields surrounding the garden. OLD and EXTRA GARDEN SEEDS can be every bit as good for green manure as the regular crops. When sorting through my garden seeds, I dump all old and extras together. When I have enough, I broadcast it thickly over a resting plot and rake it in. It makes a very interesting and rather fun planting. As the different plants grow at such different rates, I just cut the tall ones down every once in awhile, leaving the patch to grow through the season. Several years ago I ended up harvesting quite a bit of unplanned Chinese cabbage late in the fall that was growing thick and healthy in one of these mixed green manure plots. You can also dig it all in mid-season and plant some buckwheat or oats in the trash. There are many other possibilities for green manure crops. Try whatever is readily available, see how it grows in your garden, and how it works into your schedule and needs. You will probably want to avoid biennials and perennials, however, particularly if you are digging the plants in by hand. Be sure to cut down all plants before they seed unless you want them to reseed. 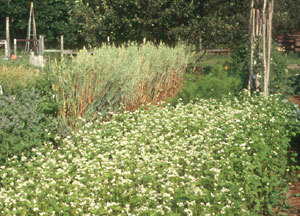 Most plants are at their peak for green manure just before they flower. Green manure seed is generally broadcast rather heavily over the plot, either by hand or, if a large area, with a hand cranked seeder. You want to plant the seed close enough together that the plants will crowd out weeds, but far enough apart that the plants will grow to their fullest. Experience is the best teacher here. If you are using a mechanical seeder that you are new to, put just a small amount of seed in and try it out, adjusting the mechanism so you don’t end up dumping your entire seed supply in the first ten feet. It’s better to go too sparse the first time around, then go over it again if necessary, since picking up over-planted seed is probably not high on anyone’s list of things they would do. Most seed doesn’t need to be planted very deep. I broadcast the seed over the plot or bed then use a regular garden rake to go over the area and sort of chop it into the soil, or into the mulch and plant matter on top of the soil. I usually let nature provide the moisture. I often toss a light coat of mulch over the area if I’m planting into bare ground to help keep the moisture in. If it is a very dry period, plant the seed deeper. And you may have to water it in. As I’ve mentioned, generally you will want to dig your green manure in when it is about ten or twelve inches tall. If it gets much taller, it is a lot of work to dig in by hand and it tends to wrap around tiller tines. That doesn’t mean it can’t be done, however, it will just be a difficult experience and you will probably resolve to get to it earlier next time. For digging in by hand, it is sometimes easier if you mow the crop down with a scythe first, then dig it in. It is going to look outrageously trashy, but who wants a plain boring neatsy garden anyway? If you are going to cut the tall green manure to sheet compost on top of the ground and not dig it in, the timing is not so critical. 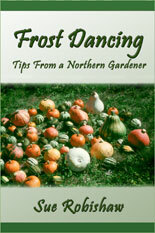 You will want to get to it while it is still green and before it starts setting seed, however. The peak time for nutrition would be just before flowering. I’ve found that a month is about the right amount of growing time in our area for most green manure crops. If I plant peas and oats the end of May, they’ll be ready to dig in mid June. Buckwheat planted in June is at a good stage in July. This will, of course, vary depending on your own conditions. I often plant oats in early to mid August to have something in the ground over winter. Oats winterkill so I don’t have to worry about them regrowing in the spring. I don’t let this crop get too large, however. Most years it will only grow to maybe five or six inches which is fine. But one warm, wet year the oats grew tall and thick and I just left them. In the spring, the thick crop mulched the ground so well that it stayed frozen well after I was working in the other plots. Because the stalks were dead, bent, and tangled I couldn’t get the scythe through them. I couldn’t rake it off because the stalks were still tenaciously attached to the roots. And because the ground was frozen, I couldn’t dig the roots up. Patience prevailed, and I finally turned it in as best I could when the ground thawed. Now if the oats grow too generously, I cut them down in the fall while they are still green. 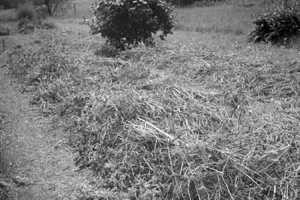 After all these many years, however, my most common and preferred method for dealing with green manure is to mow it down with the scythe, which can neatly and quickly take care of one row, one bed, or an entire plot. I then plant into the trash, or just let it lie as mulch. The easiest method can be the best. Working WITH is so much better than working AGAINST. GREEN MANURE is a natural, cheap and easy way to build and maintain the organic matter in your soil. Nature does it all the time, and look how great Her gardens are! May your gardens aspire to such greatness as well.